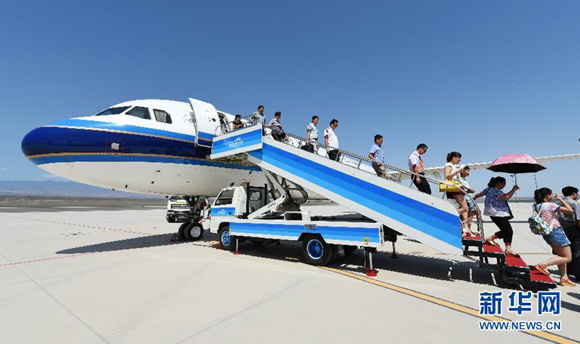 China's domestic air traffic will become the world's largest within 10 years, according to the Global Market Forecast from Airbus released Tuesday. "While established European and North American markets continue to grow, Asia-Pacific is the engine powering growth in the next 20 years," said John Leahy, Airbus Chief Operating Officer-Customers. "China will soon be the world's biggest aviation market and together with emerging economies, further population concentration, and wealth creation, together these will help to fuel strong air traffic growth," Leahy said. Passenger traffic will grow at an average 4.5 percent a year over the next two decades, driving a need for over 33,000 new aircraft of more than 100 seats, Airbus forecast. In the single aisle market, Airbus predicted a need for over 23,500 new aircraft worth US$2.4 trillion. The Asia-Pacific will account for 39 percent of these deliveries. China's domestic air traffic will become the world's largest within 10 years, a new Airbus report says.